When the Galaxy S7 and S7 edge were announced, the first teardowns of the handsets revealed some sort of a thin flat heat pipe running away from the processor area, presumably a cooling effort, like the ones on Sony's high-end Xperias, starting way back with the Z2, or the Lumia 950XL. Samsung then confirmed that the phones do indeed feature this, when talking about its new Game Launcher setup: "the cooling system in these phones, with a very thin thermal spreader, keeps devices cool, so gamers can focus on winning." There you have it, no liquid nitrogen running in your phone, pumped by tiny goblins to swoosh elegantly around the CPU in clouds of frozen mist. What we do have is flatter copper alloy piping with a drop of water inside that evaporates when it hits the CPU area, takes the heat away, then condenses back into liquid to run down the metal mesh inside and repeat the process, spreading the heat in a more equal manner, so that the CPU and your hands don't feel the burn. Samsung already detailed the challenges it encountered when designing one the smallest thermal spreaders from scratch, but that's not the only game in phone town as far as heat pipes are involved. Check out the coolest kids on the heat dissipation block below. Out of the major brands, Sony was the pioneer when it comes to employing heat pipes to cool a handset's CPU down, way back with the Xperia Z2. Its latest and greatest Snapdragon 810-laden handsets like the Xperia Z5 Premium also have heat pipes inside, as you can see in the picture here, and who could blame Sony. Designing the first phone with 4K display resolution, all glass chassis and the volcanic Snapdragon 810, has to come with a lot of thermal spreading to balance things out. The one and only 4K phone is not the only member of Sony's last Z-series portfolio that has a cooling system inside. As you can see in the picture, the Xperia Z5 also employs dual pipes to take the heat away from the Snapdragon 810 processor, but the copious amounts of thermal paste that we observed over the CPU area in the Z5 Premium, seem to be missing here. 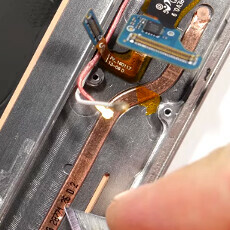 Samsung's engineers couldn't find an off-the-shelf thermal spreader solution that would do the job of cooling the phone effectively, and yet keeping its structural integrity, so they designed one from scratch, experimenting with alloys and metal mesh inside the pipe, as well as with the exact placement, so as to preserve the phone's rigidity. As a result, the thermal spreader in the S7 edge has heat conductivity 50 times higher than that of pure copper. The smaller sibling also has the same heat pipe inside as the S7 edge. The flat heat pipe uses a tiny amount of water that constantly evaporates and travels as steam away from the processor to cool down in the other end, then condense back, spreading the heat evenly around. It thus prevents thermal throttling of the CPU/GPU combo, so that gamers are always getting the maximum out of their device, when the cooling system is paired with power management on software level. Microsoft was the other major name to employ heat piping to tame the Snapdragon 810 chipset that is inside the Lumia 950 XL, and it clarified that the cooling system has been inspired by the one found in the Surface Pro 3 tablet. As Microsoft itself puts it: "The Lumia 950 XL has a traditional liquid based heat pipe solution which efficiently transfers and balances the heat inside the Lumia device. 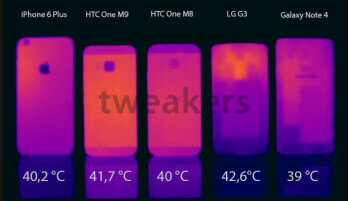 This heat transfer technology allows the Lumia device to deliver a better engine performance." The engine is strong with this one. Patiently watiting for HTC 10's teardown.. Isn't it the same for glass and plastic phones as well? I mean the amount of heat leaving the CPU is the waste energy so whether it's full metal or glass the amount of heat dissipation is same from the SoC so it won't make a difference right? I'm an energy conversion engineer let me explain this to you like this: there is a constant amount of heat produced by SOC per second which needs to get out of there, heat pipe, metal, plastic etc. all transfer heat but it's about the resistance. Imagine you open facet of water and pour it in a container with a hole. if the hole is large enough there wont be any water in the container but if the hole is not big enough there will be some water in the container all the time and its amount is linked to the diameter of that hole. heat concentration means a rise in temperature so if there is not an efficient way to transfer the heat you'll get a rise in temperature which is linked to the amount of resistance. More comforting to read about than any drug addict or zionist 'currently feeling the B(e)rn'! I am glad my S7 Edge has a heat pipe. As a guy who is obsessed with two things on any phone; battery life and heat management... I can say that the Exynos chip on the Note 5 is the coolest in the long line of phones that I previously owned. maybe you have owned. But the S7 Edge is even better. I never experience any heat for a month now. PA thanks for giving credit to SONY for the thermal pipe implementation. I thought you people would not do so. I wondered how Sony made my Z5 Premium work very well when others could/would not. They only time I can overheat it is recording 4K video and even then it stops recording but does not shut down. Lumia 950XL does the best job at taming the snapdragon 810. notebookcheck review. It turns out that Microsoft is the only manufacturer that can handle the Snapdragon 810. The Lumia 950 XL also loses some performance, but the drop is comparatively small at 14.5%. Other smartphones with the same SoC suffer from bigger performance drops, it does not matter if you look at the LG Flex 2 (-16.2%), OnePlus 2 (-33%), Sony Xperia Z5 (-29%), Nexus 6P (-31%) or HTC One M9 (-38%).